The Felsted® Electronic Vernier (EV2), has been designed to provide precise, variable engine speed adjustment on electronically controlled stationary engines, or from a remote operating position on mobile equipment. We have engineered the EV2 to allow capability with most electronically-controlled diesel engines. The EV2 is easy to operate, even with gloves on. The large (2-1/4”) diameter, easily identifiable knob provides continuous engine speed regulation from idle to wide open throttle in seven (7) full turns, providing fine engine speed adjustment. To prevent accidental overrevving, the EV2 cannot be pulled to the wide open throttle position – it must be turned. It does, however, offer a quick shut-down feature activated by pushing in the knob. The EV2 also offers an adjustable friction collar to prevent accidental changes in engine speed. When a change in engine speed is desired, the friction collar may be loosened. The Felsted EV2 is easily installed in a very limited amount of space. The EV2 requires a .78” diameter drilled hole, and only 4.5” clearance behind the dash panel. The EV2 is pre-set at the factory, with no field adjustment necessary. 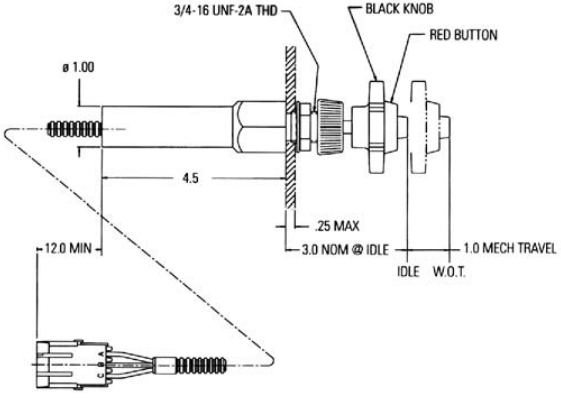 The potentiometer unit is sealed for protection against moisture and contaminants.